-- Select a Color -- Cream - Out of Stock! Silver - Out of Stock! 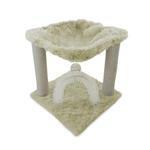 The Tiger Tough Plush Cat Hammock will be your cats new favorite spot to play, scratch, and nap! The Tiger Tough Plush Cat Hammock is a great way for your cats to lounge, play, nap, and scratch their way to happiness! Its smaller size makes it an easy addition to any room or home decor. The petting/scratching brush on its base and plush ball toy allows cats to be entertained for hours. 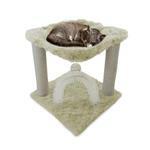 After a long days play, the comfortable hammock conforms to your cats body for comfortable naps! 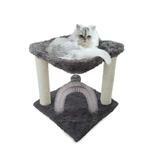 To top it all off, the scratching posts provide even more fun. One Size: 15.75" x 15.75" x 17.3"
I appreciated the generous discount as a first time buyer with BaxterBoo!